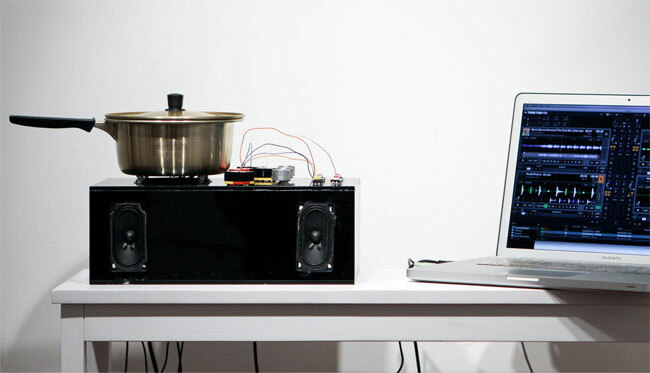 Interaction artist Viktor Jan has created a unique way to create music, transforming a cooking pot into a Midi DJ interface, using a little Arduino magic. When electrified objects go into the cooking pot, they send current through the pot to an onboard Arduino, which then creates tones and beats for that object, that can be further manipulated using the extra dials and knobs on the side. Watch the video after the jump to learn more about the Beatoven project and see it in action. At the moment the Beatoven is more of a proof-of-concept rather than a fully finished concept, and Jan is hoping to modify the design even further to work with real food. More information about the Beatoven concept is available over on the Viktography website.